Having lived in North Carolina for a few years, Liz's brother Daniel decided it was time to see some "real" mountains again! He chose Pioneer Basin, as their family had done a lot of hiking in that area when he was younger, but he hadn't previously gone over Mono Pass and into the surrounding area. And having done very little hiking of any kind in the Eastern Sierras, I was more than happy to join him for the trip. Liz and I had a nice drive over to Mammoth Lakes on a Friday, where we met up with Daniel and the rest of family. Saturday morning was clear with abundant sunshine, a great way to start. 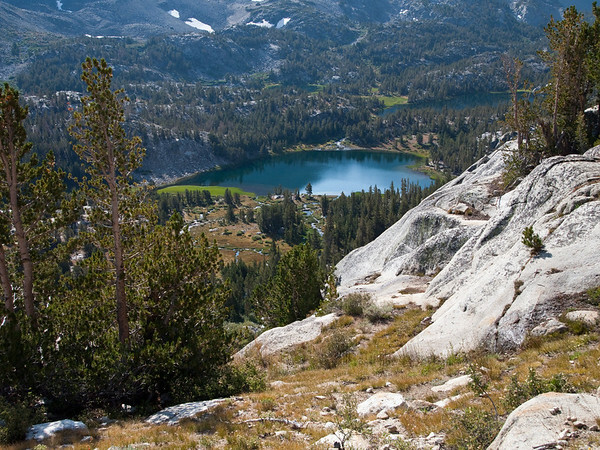 We began hiking at the Mosquito Flat trailhead, which at 10,250ft is the highest trailhead in the Sierras. As we started the climb I could definitely feel the extra effort needed due to the thinner air. I was somewhat surprised at the amount of snow at Mono Pass, and a fellow backpacker I spoke with later confirmed that he had never seen so much snow still remaining there in early September. After lunch near Trail Lakes, we could see ever more clouds in the distance- a sign of things to come. After a fairly punishing decent we then had to start climbing again to get to Pioneer Lakes. We were pretty tired by the time we got to the first lake, however it was fairly crowded with folks that had ridden in on horses, so we decided to head to the next lake, which meant another ~500ft of climbing. Upon arriving at the next lake, I wasn't feeling too great, so we just chose the first site we came to and set up camp. Daniel did some further exploring while I got some rest, presumably suffering some ill effects from the altitude. Later in the evening, there was an impressive amount rain together with thunder and lightning! The rain lasted about five hours, and unfortunately this was the first time I had set up this tent in the wild, so it wasn't the best job and some water got in and proceeded to soak many of Daniel's clothes. The next morning I was feeling much better- whew! Although there weren't clouds directly overhead, there were plenty of ominous looking clouds in all directions. The original plan had been to attempt to climb some nearby passes and peaks, though given the weather we settled on exploring the rest of the lakes instead. After exploring for a couple of hours, we packed up and decided to head back the way came and just see what happened. Naturally, rain happened! As we were having lunch down by Mono creek, the rain definitely started picking up. After continuing on a little ways, we found some trees and took shelter under them for a while. As we were watching and waiting, we could see the rain at higher elevations (where we were heading...) turning to snow. We looked for a place near Golden Lakes to setup the tent, but everything was quite exposed. By that time the rain was diminishing, so we pushed onward and upward, with the idea that any elevation gained today meant less work tomorrow. When we got to Trail Lakes the rain had mostly stopped, though the clouds and wind were still blowing, and there was a fresh dusting of snow visible in many areas. We found a great spot and set up camp, taking extra time to get the tent right. Eventually the weather settled down and we spent some time exploring the area. When I got up in the middle of the night, I was startled to find a clear sky with a nearly full moon shining bright- beautiful! The next morning was clear and very, very cold. Given we were essentially located in a rock bowl, it was nearly 8:30am before the sun was high enough to hit our tent and start thawing us out. I was quite jealous of the campers on the other side of the lake that got the sun before us! Soon enough we were on our way and quickly shedding layers, as it was now clear and we were getting quite warm as we ascended. There was even more snow up at the pass, though that really didn't diminish the feeling of being on some sort of lunar landscape, as it was mainly just sand, boulders, and rock walls, with hardly any vegetation in sight. Soon enough we were heading back down, and as we began to see more day hikers knew that the trip would soon be over. Despite the cold and wet weather resulting in some alterations in the plans, it was a great trip!